First off, please don't shoot me! I know you guys probably get inundated with these conversion threads, but I just need to clarify a few things before I get going. Second, please pardon my newbness. I want to set up my fat bike as a single speed. 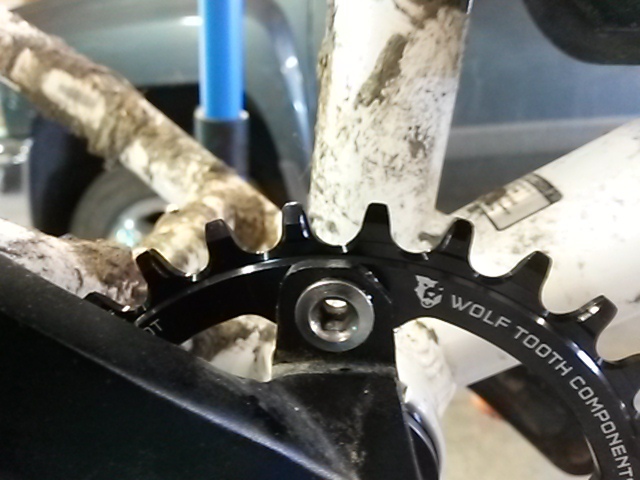 It's currently a Shimano/Sram 3x8 with the outer ring ground down to a bash guard. My front derailer is a Shimano Alivio E type that I will be removing. When I take this off, I'll need to substitute in a 2.5mm spacer to make up for it correct? The bike currently has what I believe is an unbranded Shimano three piece square taper crankset on it. I had planned on removing my small and middle ring and replacing the middle ring with an actual SS ring. Will this be an adequate setup? I'm working with a 96 BCD, any ring recommendations out there? So far all I've really found is Wolf Tooth but I haven't been looking a ton yet. I'll be doing some searching on the forum for a recommended conversion kit, but if anyone want's to post one here it'd be appreciated! Thanks for any help or info. Excited to try this. Edit: Okay so never mind. Some extensive searching seemed to find most of what I needed to know. 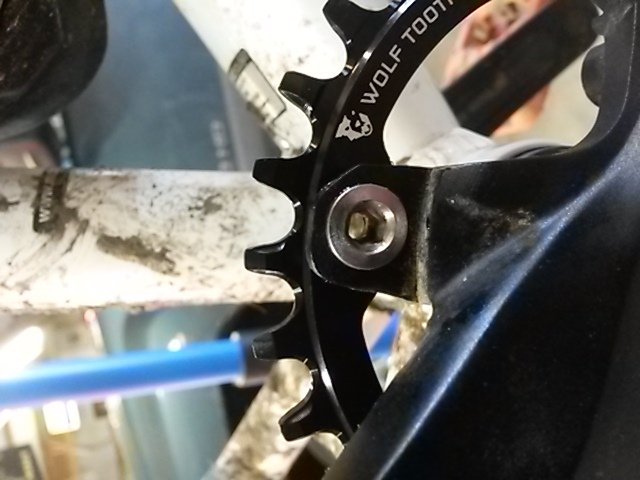 Because of the stupid 96 bcd, I did have to go with a narrow wide chainring (all that's available). Hopefully that will work okay with the rest of my setup. I'll be using a Surly cog, KMC 610 chain, and Gusset Bachelor tensioner. Last edited by Shinkers; 03-30-2015 at 09:59 PM. I think you're right about WTC. You're correct there, it shouldn't pose any problems. One option for tensioning is a YESS ETR-B if you can find one, which would take the place of the E type derailleur and allow easier rear wheel removal if required. I have a Blackspire Stinger chain guide doing the tensioning job on one bike. You'd need the version that takes the place of the E type or spacer. ... except I'm not sure how tyre clearance works out with BB mounted devices on fatbikes. Might be OK: after all, your chain has to clear the tyre too. You guys are awesome! Didn't even notice the Stinger tensioner, and will run out and look at whether that will clear or not. Biggest concern with that is that even though my bike uses an E type, it's kind of a retrofit type deal. Rather than actually bolting on to anything, it just get's sandwiched by the BB cup and there's a small slot in the BB shell that it fits into to keep it from rotating. Also, this bike has a square taper spindle. I see black spire says that their dewlie isn't recommended with square tapers, but don't know if that'd matter with the stinger. I got everything I need but my chain ring so it'll be next week most likely. Is it a Mongoose Dolomite? Will this be too close? Okay, didn't seem to have any major problems, so I guess they aren't too close. I tensioned my chain and went out and rode around the yard and had some popping under really heavy load (everything I had). When I stopped, I looked at my chain and it was pretty loose. So I retensioned it and tightened my bachelor down really tight. Set the chain a bit tighter than I had it too, and it was both quieter and didn't pop at all. Guess I'll run it and see what happens and how long it holds up. Freaked me out cause the last time I had a cassette pop it was a damaged cassette doing it. Though as burly as these Surly cogs are and the KMC 610 chain I'm using, it looks like it'd take a lot to bend them.